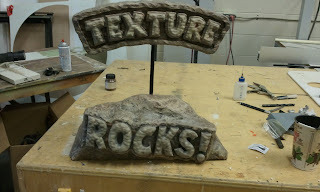 I finished the final paint on the Texture Rocks display. Woo-hoo, done! The gear motor works great, and jumps teeth when it's needed. I like it when it all works out! The other job at hand was a sign I did for another shop 2 months ago. Their client decided they wanted to V-carve the border and text. This meant putting this 2'X3' slab back on the router for additional carving. Not an easy task at this point. I finally got it synced up to the original Aspire file. Not an easy task at all, due to the fact that the file didn't reside at 0-0 originally. Set up time: 40 min. Router time: 2min 28 seconds. head shaking time: still going! Jody and I are heading off to Indiana to teach at Robert Jones sign camp next week. This is going to be a lot of fun! There are 30 people signed up, and they're ready to learn. I'm pumped at the opportunity of learning as well. There will be a lot of very experienced people attending. I plan on posting daily during the camp, with as many pics as I can. 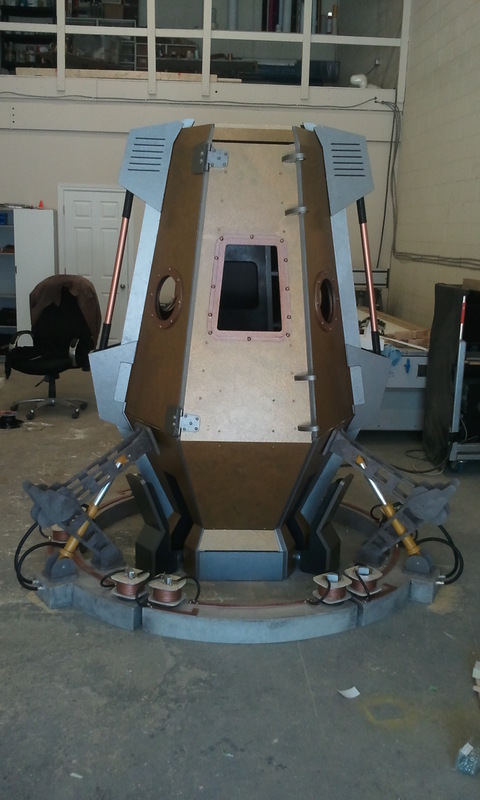 With the Time Machine gone, were back to finishing up some projects before our next set build. 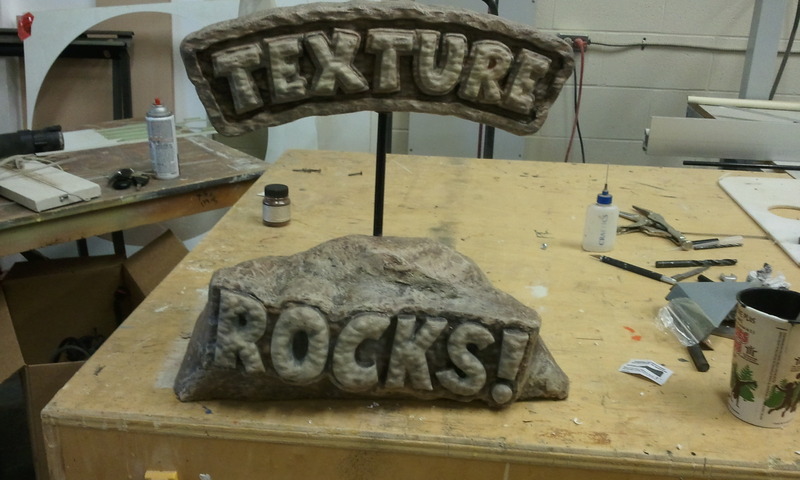 First up was the texture rocks display. 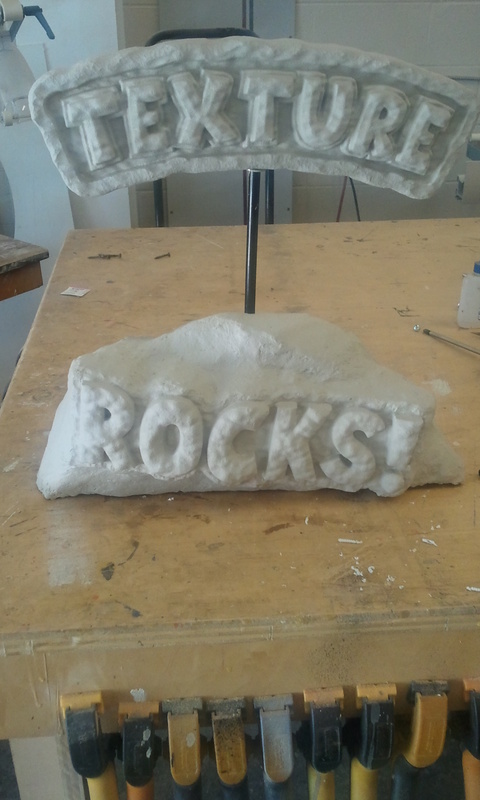 It was left at the point where the rock was constructed from fiberglass reinforced bondo over a styrofoam base. I had hogged out all the foam so I would have an empty shell for the motor. 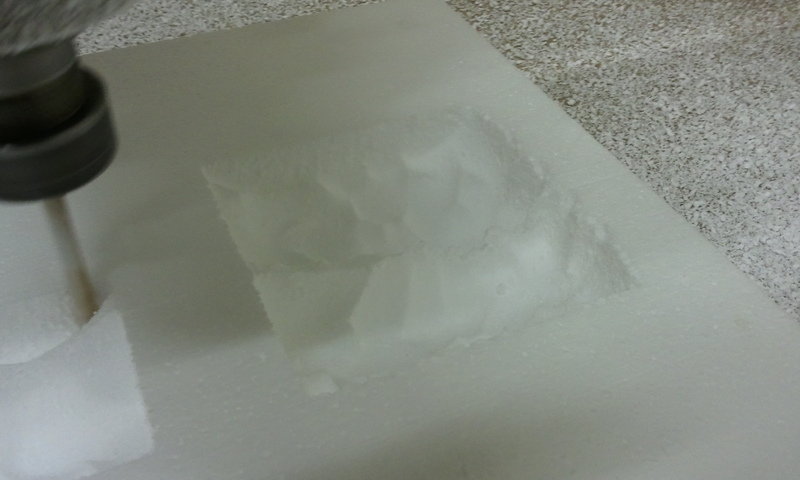 I punched a whole through the top for the butyl tubing that the 1/4-20 rod will run through. I had a 12v gear-motor set aside for just this gig. It had a rather large pully pressed onto the shaft, and I had no desire to remove it. The plan was to just cut the pulley down to size on the table saw. The pulley has 4 radiating strengthening ribs molded into it. These are what I'm going to use to turn the top portion. 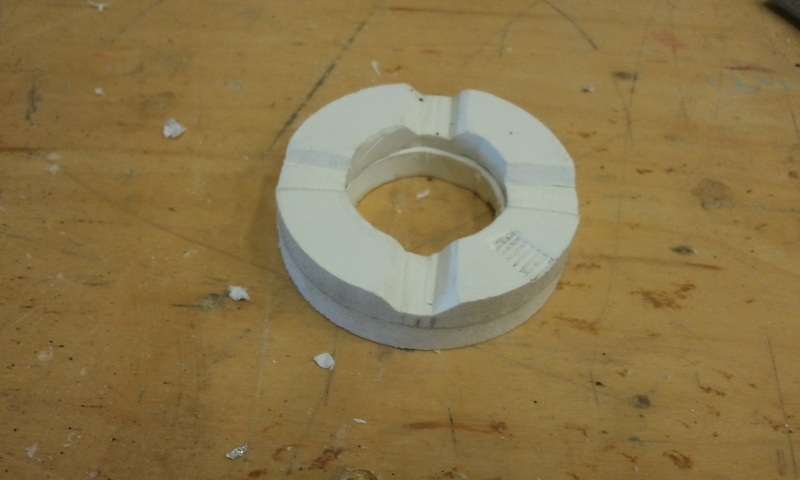 I made a quick coupler from the many offcuts of sintra that were left over from the coils on the time machine. I would have cut them on our Techno cnc, but today was feeling like a lazy day, and I couldn't be bothered to fire it up. You'll notice the grooves in it, these are going to sit over the ribs on the pulley . I also rounded them over so if anyone was to grab the rotating part of the display, it would bump up and jump slots, saving the gear-motor from damage. I added a piece of 1/8 aluminum flat stock, drilled to fit the existing threaded holes on the gear-motor box. I tacked it with crazy glue so it wouldn't move. I also drilled some divots in the HDU that will act like a mechanical lock for the reinforced bondo that will eventually hold the flat stock permanently. 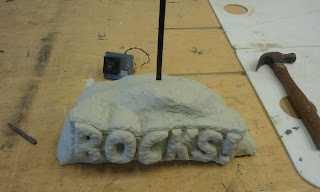 The other side is pretty rough due to the styrofoam buck melting a bit with the bondo, so I didn't need to add any divots on that side. This will definitely hold the flat stock in place! 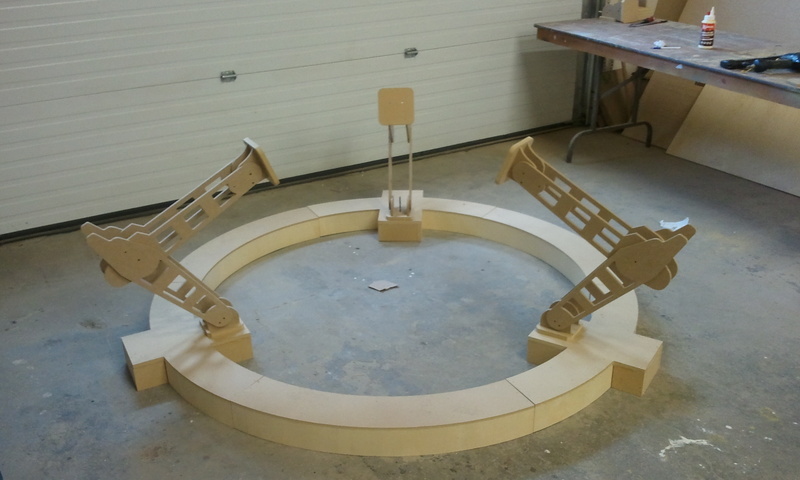 With the assembly all together and rotating properly, it's of to paint. 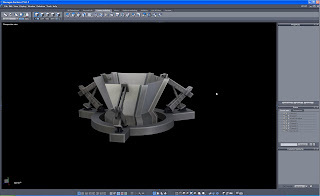 But not today, I'm going home to finish some 3d modelling. Today was the final day for the Time machine. We spent Monday and today doing the patina, and making it a little more aged. I also picked up the 5 point harness that was in the script. This was very easy to install, mostly because it didn't need to be functional. 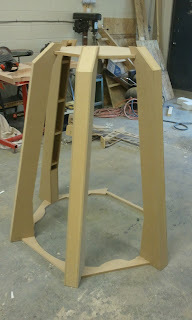 I'd hate to be ripping through a dimensional worm-hole knowing the only thing holding me in was a few bolts into 1/4" MDF! We also added some copper looking frames around the vents on the pop-outs. This, and the patina, really helped pull it away from looking too Star Trek, and a little more "fabricated"
We grabbed a wiring harness from our Mechanic neighbor. I think it was from a Dodge Neon. 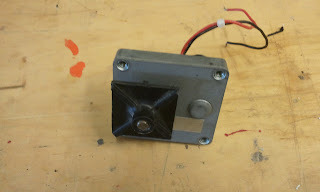 We used the connectors as they were, screwed them into the inside, and ran the wires to the many available openings in the structure. It looked pretty complicated. I'd hate to trace the wires if they actually did something! 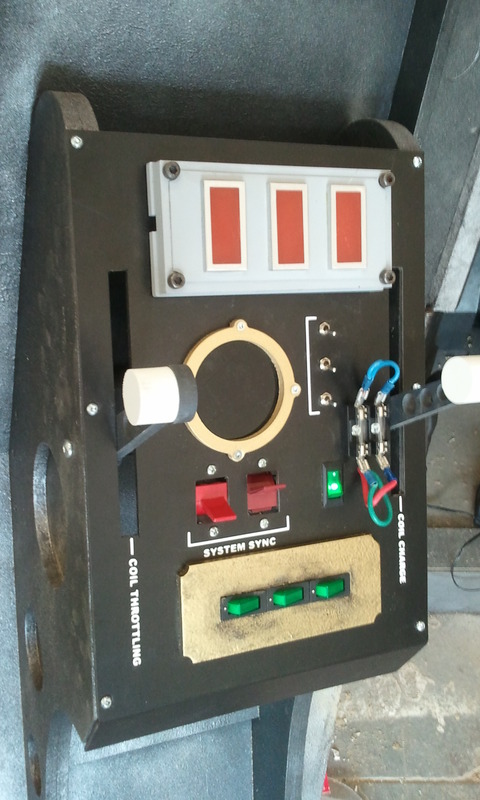 The control panel was put together from the various odds and ends that seem to be in every box marked "electrical" at the shop. 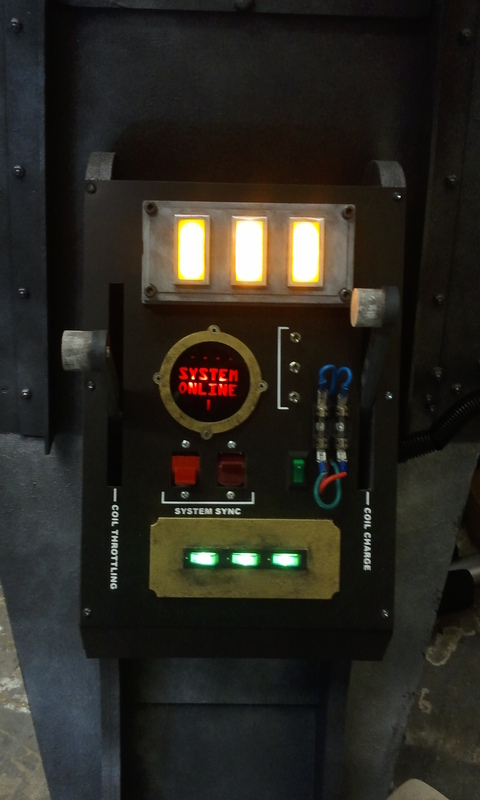 The levers move up and down and most of the switches light up. All of the lights are 12v automotive products. The centre ring display was made from a piece of 1/8" translucent black acrylic. I reverse cut a simple message from black vinyl, and applied it to the back side. That way when the light is off, you don't see that it says anything. This was another great build! Thanks again to Chris Crane for getting us to work on this one. He was involved with the shoot for the Death Machine we did last year. It's always a little sad to see a project come to a close (for the most part) It feels like my kid is moving out or something. Weird. The only trouble with longer than 3 day builds is the fact that I run out of interesting post titles! 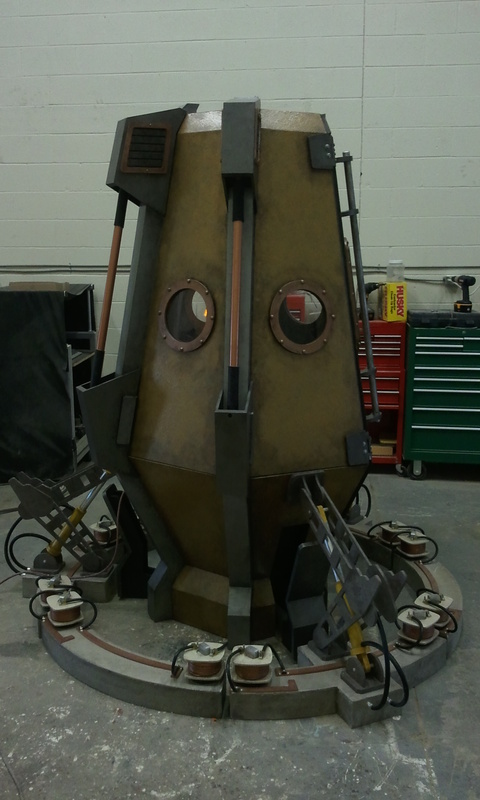 The last few days have been spent stripping everything down on the time machine, and painting it. There was a few small things I still had to wrap up. We got the aging done on the coils and hydraulics. And we got all the hoses and wiring attached to the ring. We did the inside in a dark asphalt grey colour, with burnished aluminum. The inside I wanted very nondescript. I didn't want to be able to identify the material, but still keep it some form of metal. One of the colour sample images was steampunk looking. 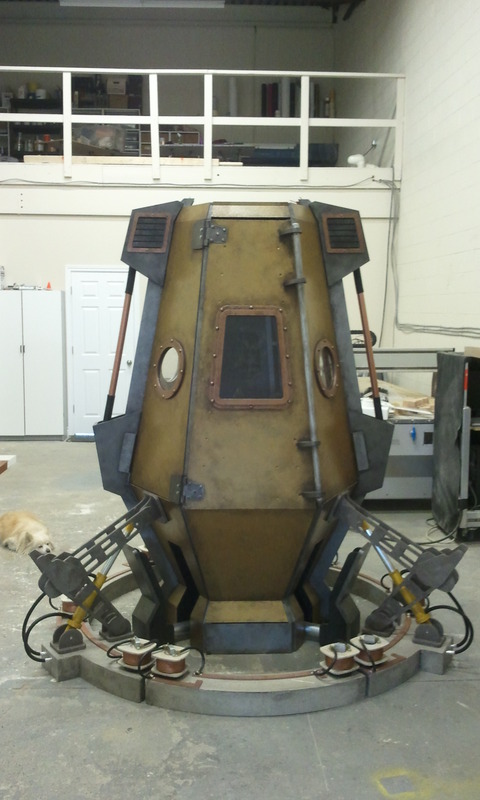 Now steampunk didn't fit the design of the pod very well, so we went with a hammered bronze finish for the main panels, with copper-y coloured port holes. This has a slight nautical feel, and really looks awesome. Still more to do tomorrow, and Tuesday. 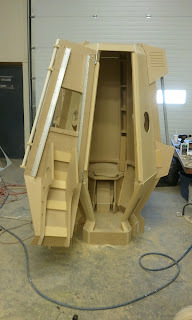 We still have to cut the window glazing, and make the control panel. I really dig this machine. They're gonna love it. Another fast paced day getting the time machine fabricated. We got the door finished and mounted. The pop outs got finished as well. 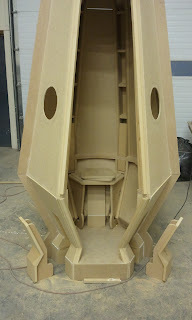 I think we're all done with the MDF! That'll be nice, the stuff gets everywhere. I can also hardly wait to get rid of all the off-cuts, they're really starting to pile up. I think I've used every available corner in the shop to store them. 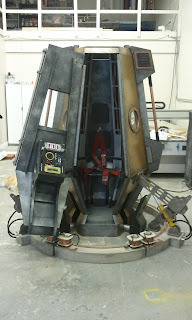 I really like the way the door swings out with the control panel mount on it. I had to add 2 unplanned aluminum angles to stiffen the door up. They're a little bright until the paint, but they worked like a charm. The door is rock solid! I cut an additional 2 portholes for the requested profile shot, I think it actually looks better from the side with them. I also cut the coil tops and bottoms out of 1/4" sintra. The spray can is for size, they're quite big! 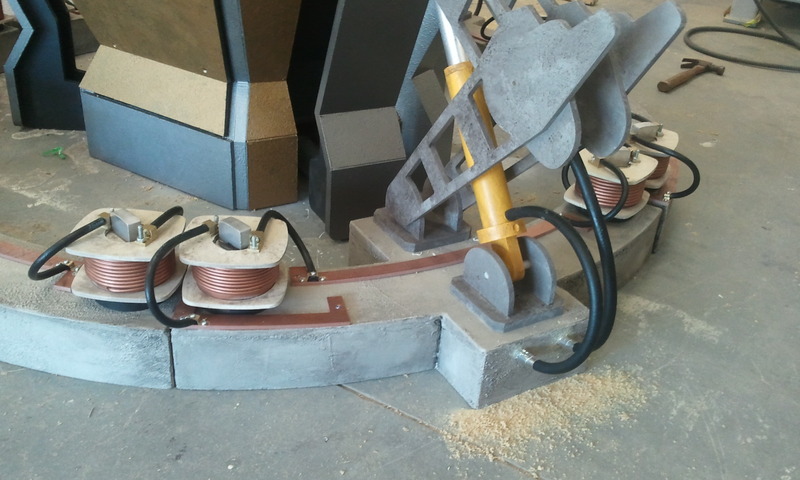 This is pretty much the configuration of the coils on the concrete. I got the connectors cut from sintra as well. They'll get screwed down to the concrete, with big, thick cables running to the coils. It's gonna come in leaps and bounds now that all the angle figuring out is over! Tomorrow we're headed out to get all kinds of wire for this. Not real wire mind you, just the jacket. I found a place that stripped all the copper out and throws away the jacket, just what we need for this. It's all about looking the part! The title says it all! 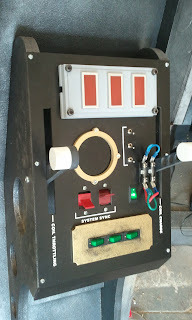 I spent ALL weekend working on the time machine, and it's various bits and pieces. 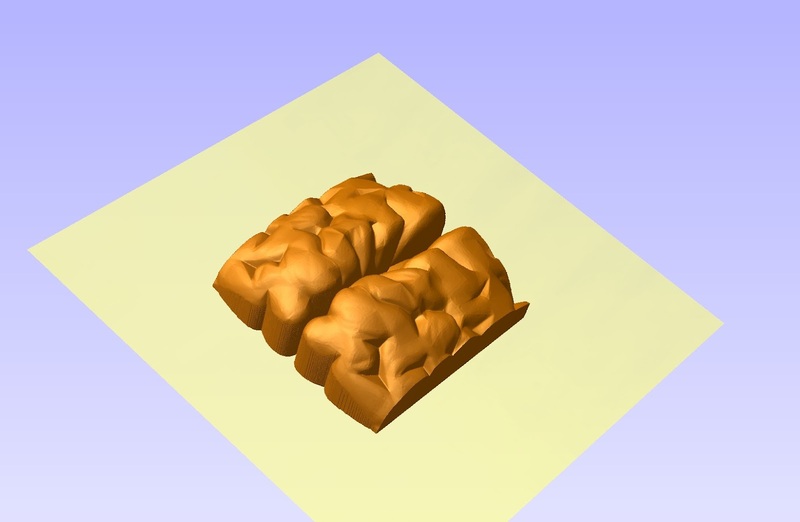 The compound angle drastically increased the time it took, even with small things. 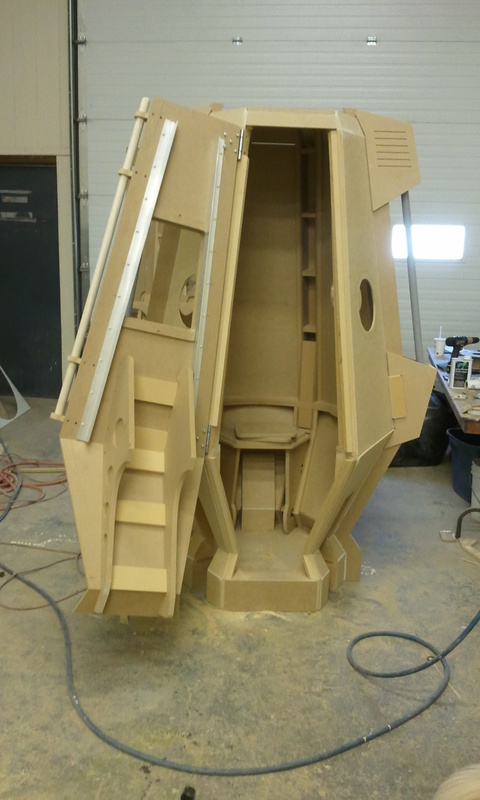 They had asked for 3 legs that would "come out" of the pod, in addition to the hydraulic supports. This proved to be more difficult then I thought. I hate having to modify parts that come of the router, but once they've been attached, I didn't have much choice. This is where I was by the end of today. The legs slide in and out from under the base. They'll get a shiny piece of pipe to look like another hydraulic cylinder. 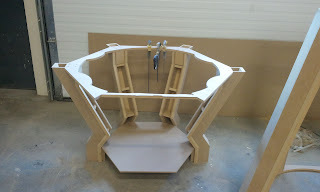 The basic seat frame also got installed. 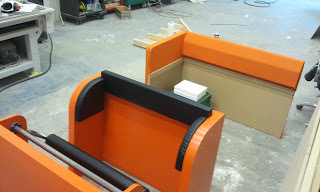 We're going to rubber coat the 3/4" mdf pads so they look like vinyl seat cushions. 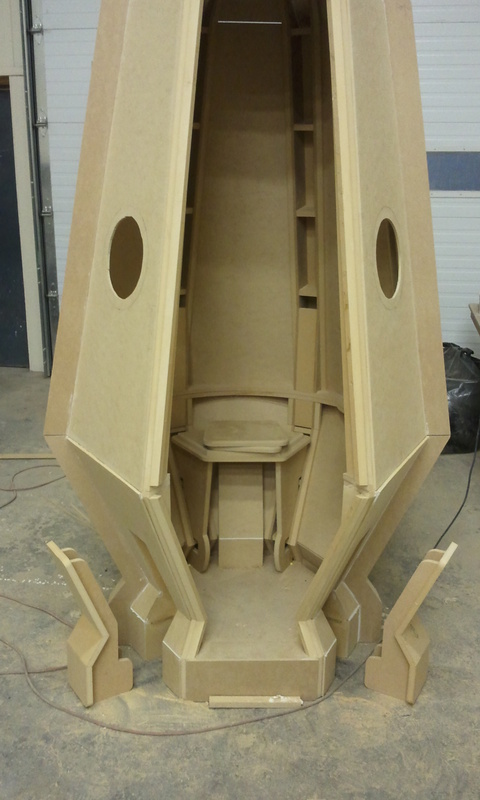 There will also be 2 more pads that run up the back wall as a seat back. They won't be overly comfy, but they'll certainly look the part. 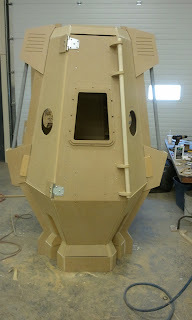 The circular port hole were an additional request, and they would also like a profile shot of the actor in the pod, so I think this means 2 additional portholes on the back side. 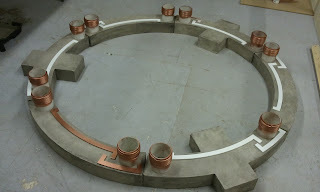 We started the stator coils today as well. 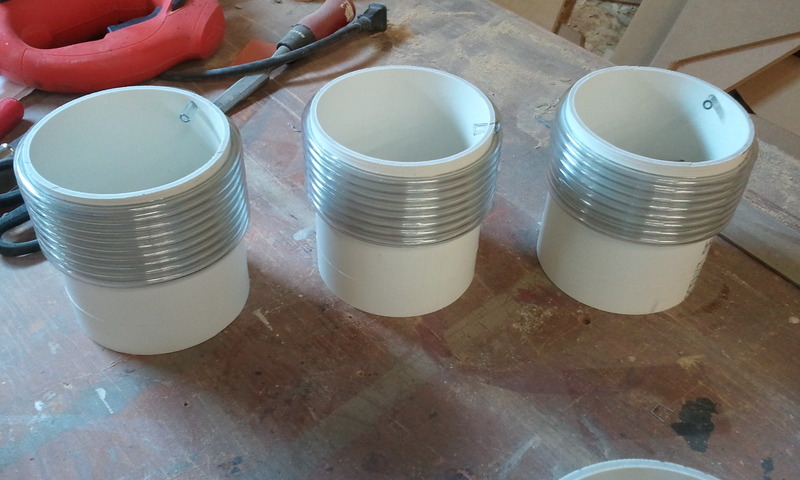 These are just 4" PVC pipe wrapped in 1/8" vinyl tubing. We actually need over 200 feet of the stuff, so using real wire was a little cost prohibitive! The coils still need they're top and bottom plates, but they off to a good start. 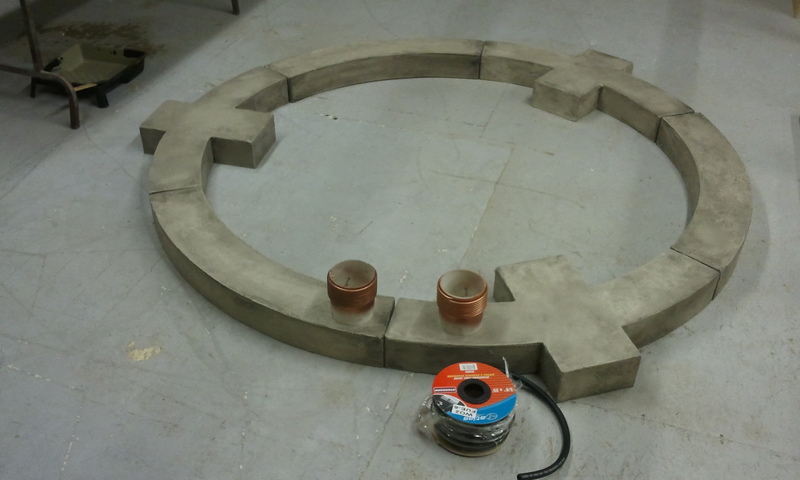 The concrete ring got it's final colour, and this is where the coils will live approximately. The got sprayed out copper, and when they're all built, we'll wash them down with a dirty wash of paint. they'll look well used for sure. 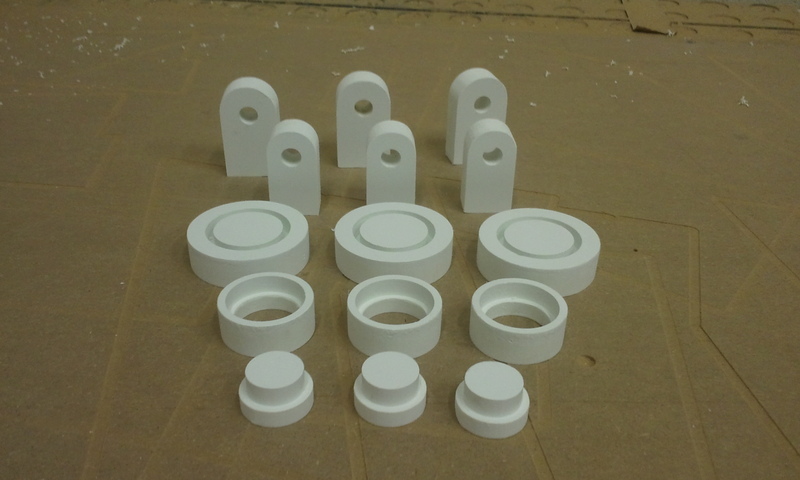 I drew up the final pieces for the hydraulic cylinders this morning and got those cut on our Techno cnc. I had to re-cut the centre reducers, as I got all confused about which circles got pocketed, and which circles got cut right through for the pipe. 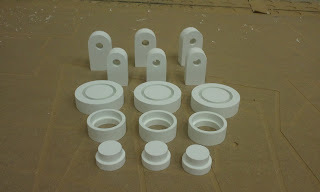 I machined all of these pieces from 3/4" pvc sheet. 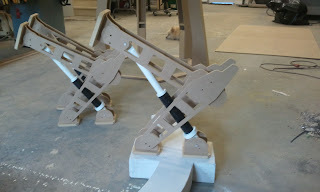 As both the ABS pipe, and the PVC pipe are so out of round, it meant leaving a pretty sloppy tolerance on the reducers. But they worked out. I chem-welded all the parts, then drilled them out for additional screws, just so I didn't have to rely on the glue alone. I've got lots of 1/2" extruded acrylic rod, so I used some of that to make the pins that will hold the cylinders to the arms that "support" the pod. 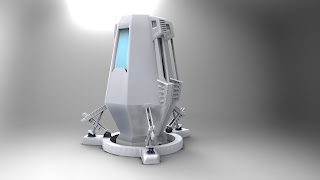 I just received word today that they want some kind of retractable looking support legs on the pod as well. This is going to require some imagination, as we are getting a little crowded at the bottom now! These look great! With some paint, chrome and hydraulic lines, they'll be quit convincing. When I was drawing up the files, I put in 1/4" holes for the pivot points (even though they don't move) that we will run a bolt through. I also added additional 1/4" locating holes throughout the various parts, including the concrete curb. This let me assemble them all without having the pod built for the angles. Everything lines up perfectly. I also got the lower section of the pod framed up as well. 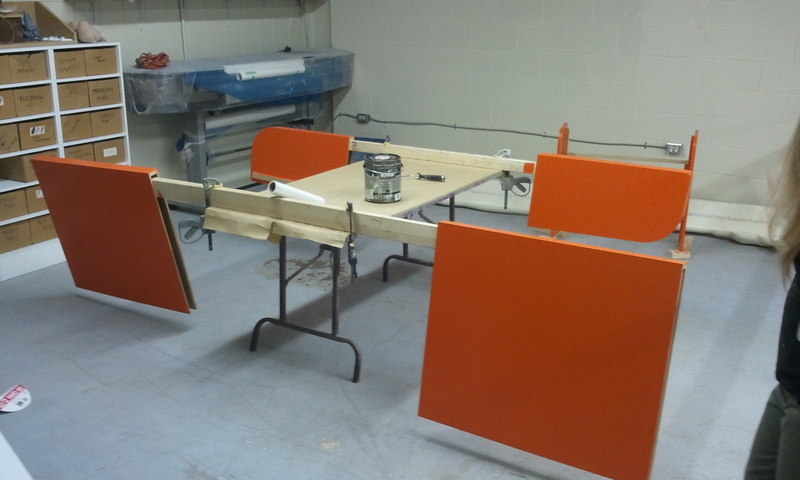 I added mitered strips up all the main support frames that will let me attach the 1/4" wall panels to. Jody made a great start on the concrete curb painting. Those should be finished up by tomorrow. 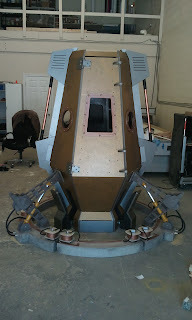 I'm hoping to have all the fabrication done by Sunday, this will leave next week for paint and gak! I really want to make some large stator coils that mount to the concrete, with big scary looking power hook-ups. I want to be very, very afraid of being electrocuted when it's done! Sometimes things can take a while. Sometimes longer than I'd like. Oh, I know it seems like everything I touch turns to gold, and that everything runs like a well oiled machine :) but the joking aside, not everything is easy sometimes. I had to re-draw some files that I planned on cutting because, I had the brainiac idea to change material thickness, and that compounded all the way down the line. Including a full sheet of MDF that unknowingly took one for the team. Can't win em all I guess. 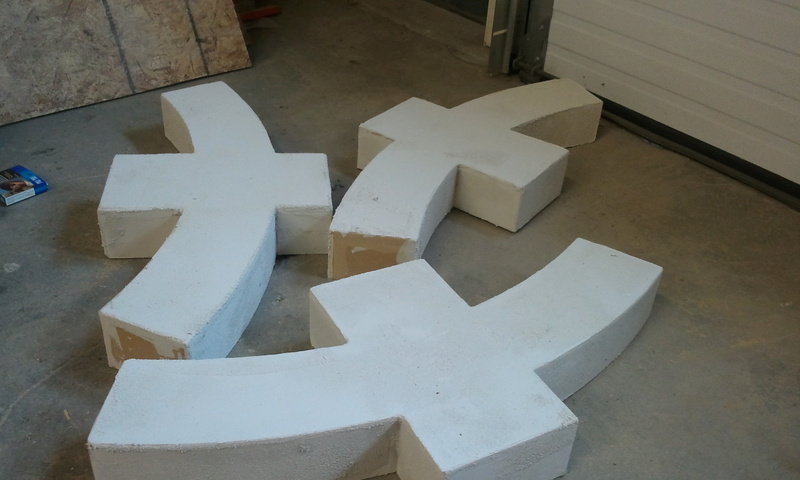 Jody got the parging on the curbs They're gonna look great with a coat of paint on them. These are the main supports for the top half. These, after the already mentioned issue above, fit together like a glove. 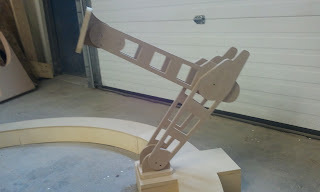 And that's all I got for fabrication today. I hope tomorrow runs a little faster. 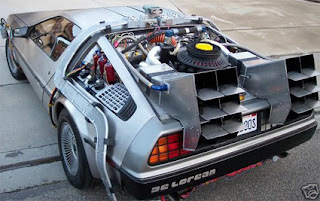 It's a time machine......type thing.. The whole weekend was spent in front of the computer again. Between beer tap models, Frankenstein models, and the time machine model, it was a lot of 3D! 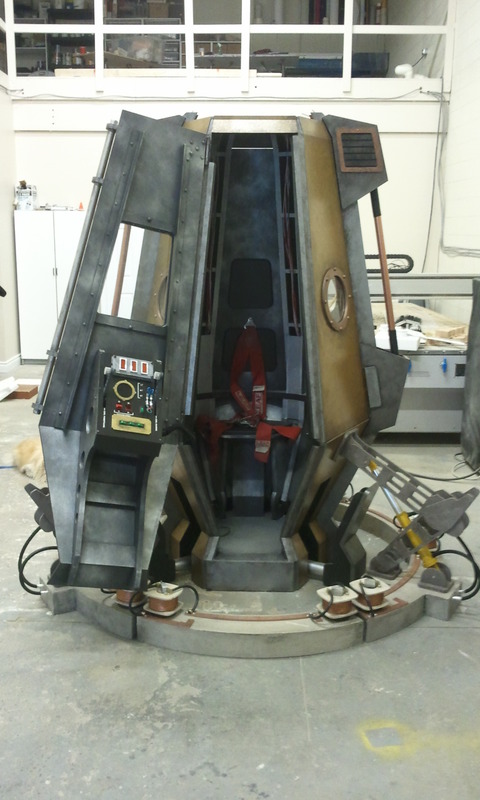 I spent quite a while to come up with a usable design for the time machine pod. Another short-ish deadline. 2 weeks to be exact! I sent the render off to the production designer and director, and with some minor changes, we all agreed on a design. 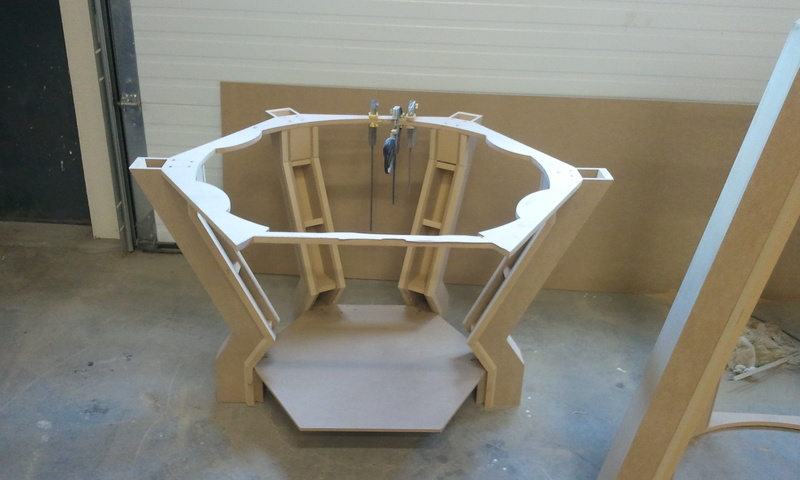 That left yesterday to get started on picking up materials, and generating files for Aspire and our Techno cnc. At first, I thought that this would be a great design, but I was worried that it might look too familiar to the audience! This won't be anywhere near the final finish. I just rendered it with a default clay material, as the focus was on the design at this point. It has to meet a few script requirements. 4) it needs removable panels to be able to get a camera into. The worm hole will be left to post production, but I'm gonna make some cool insulators that would be the start of the generating. We are going to change the window on the door to be more of a bolt on version, as well as add a window to each side of the door. This is how it will be shown when they're trying to rebuild it with partial blueprints. So this is the obvious split point for the 2 halves. Plus, it'll be easier to manage for production, as we won't be on set for this. By the end of the day, I had the base ring, and hydraulic supports fabricated. The base ring we will finish like a concrete "curb". We will hit all the corners with a disk grinder, then parge it up. I hope to get to making the hydraulic cylinders that attach to the arms tomorrow as well, while the Techno cnc is chewing through more MDF. The roller coaster car and the big brain got delivered today! It was great to see George and Matt. Everyone at the studio is so nice. On another note, I found the short film we did last year with the Death Machine on You Tube. It's only ten minutes, but it brings back a lot of memories! In fact, I can remember exactly where I was hiding out in every scene that involved the Death Machine! Congratulations to Simon and everyone who worked on it. It was a blast! Please keep your arms and feet inside the car at all times. 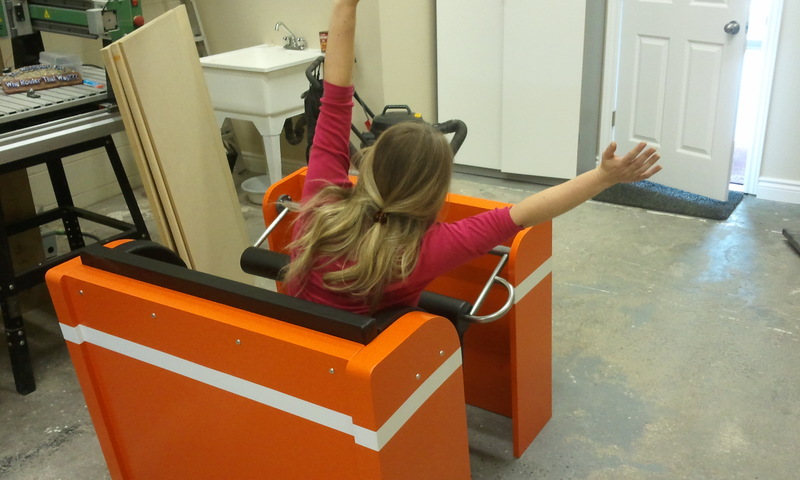 The roller coaster car and prop couch back are done! I picked up the lap bar we had fabricated at B&M Welding. They did a great job as usual. The recently got a cnc pipe bender, and this was the perfect job for it. 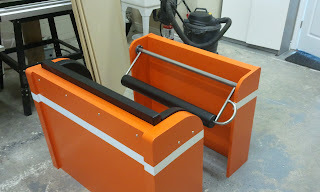 I also made the padded portion that locks on the passengers legs. Although ours is a piece of 3" abs pipe, with end caps made from 1/2" rigid pvc. The caps I drew up in Aspire, and cut on our Techno cnc. 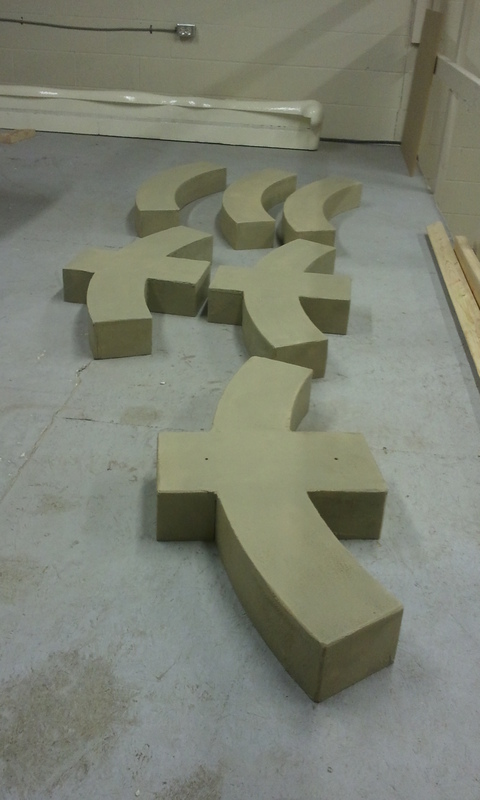 Here's the final pieces approximately laid out like in the shot. Although you'll never see the floor in the final shot. I took a picture of the away from camera side, so you could see what it looks like. We also cracked open the styrofoam brain mold first thing this morning. 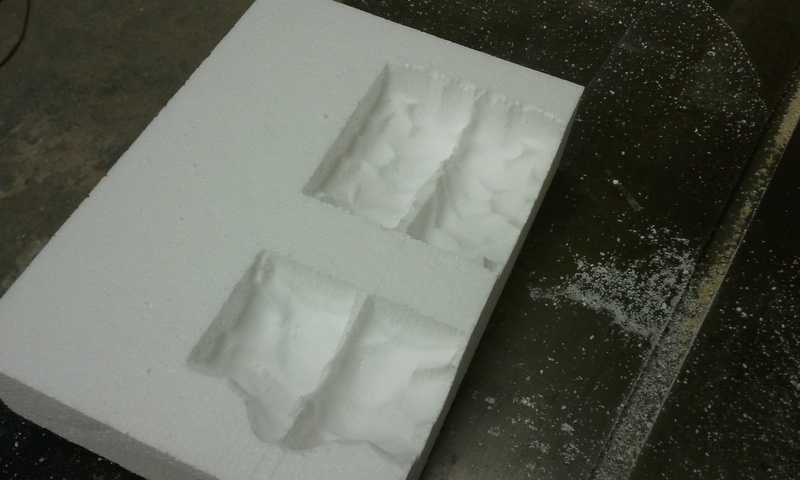 This was straight out of the mold, before I cleaned up the seams, and cleaned off the extra bits of styrofoam. 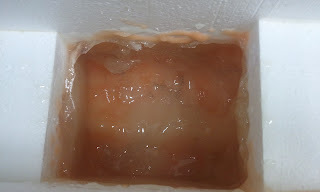 The styrofoam did melt under the heat of the resin, but as we did a thin first slush coat, the shape was already formed before the styrofoam melted under the heat. I added 4 12v lights, and sealed them in with silicone so they wouldn't short out in the liquid. 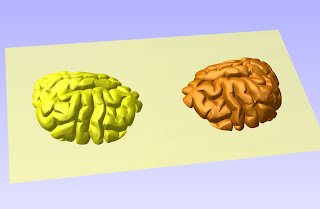 There's no brain stem, as the image will be cropped off before that point. I also added some loops of weed-eater cord through holes we drilled in it. This particular cord was very translucent , and lit up well, for what it was. If they weren't shooting in a liquid, I could have added some pretty cool luminescent wire, but that would last about 2 seconds in the liquid! 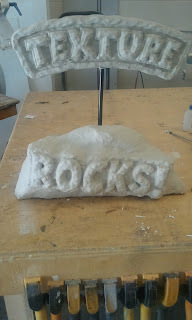 Here it is unlit. Im glad we made it glow! 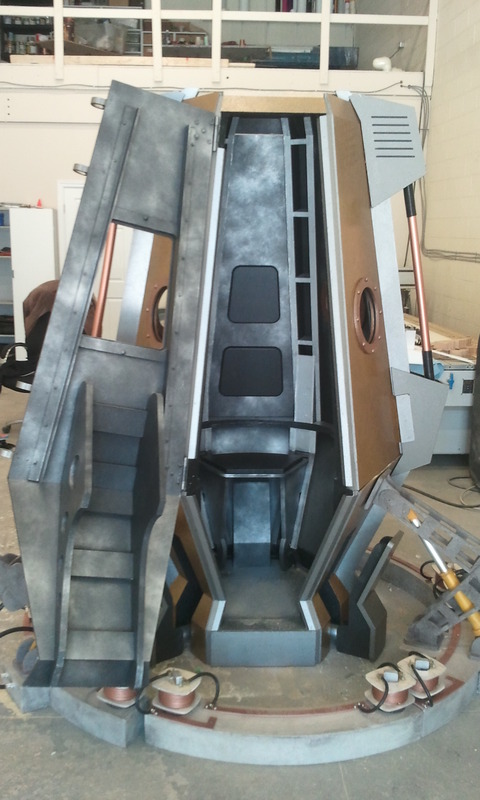 Delivery tomorrow, then it's on the the time travel pod! They Lie, Size Does Matter! But only when it comes to brains! The roller coaster car got it's electric orange colour applied this morning. 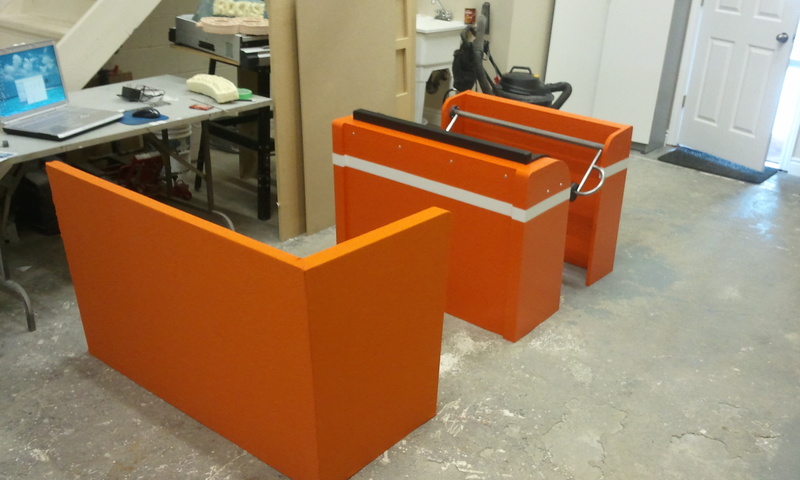 2 coats covered extremely well, even though it was as bright orange as it was. Tomorrow we will get the lap bar on and final assembly ready for Thursday delivery. 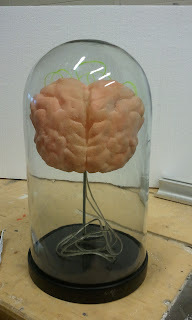 We also started the big brain that will be shot in a bell jar. The jar is HUGE. 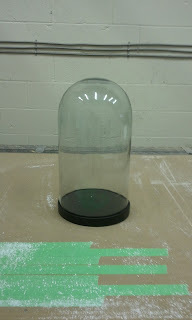 Well it's huge for a bell jar to me anyways! It stands 20" tall and about 9" in diameter. Filling it will take a rather large brain. A normal size brain model from a medical supply place is pretty small, and would look puny in this colossal jar. So we're making one. We are lucky to have complete control on this job, whatever we like, we can do. They are shooting this 2 ways. One way will have the jar and brain upside down and filled with a liquid of some kind, and they'll flip it in post, and the other way will be the right way up with no liquid. 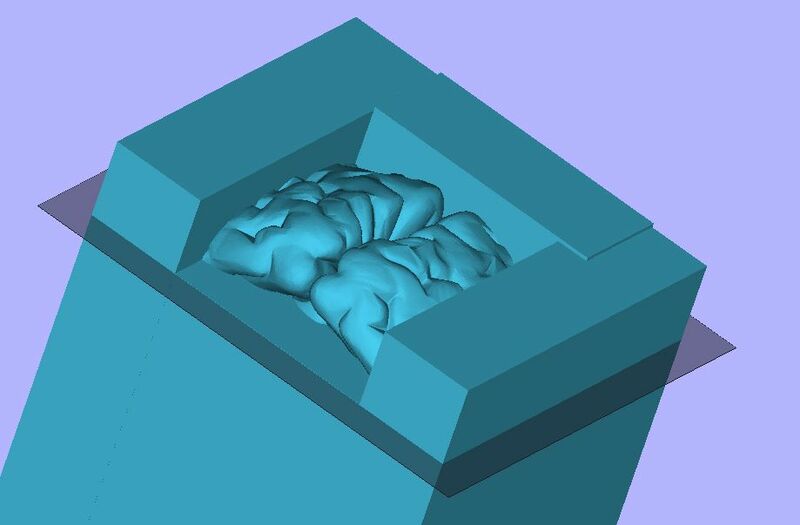 I could have sculpted a brain out of the many weird products we have here by hand, BUT all those materials would be solid and opaque, and that's pretty boring I think. I want it to GLOW! 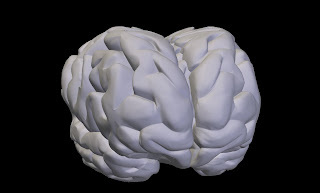 So I found a pretty cool 3d model brain on line and downloaded it. I usually do that first for generic things. Why model it if one exists already. 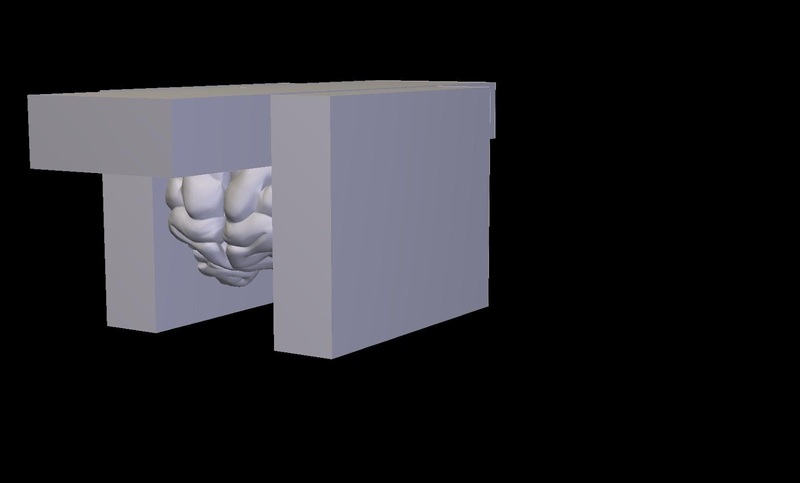 This is the brain after I did some sculpting in Hexagon. I like that it now pulls down in the middle. I quickly found out that the original geometry wasn't all that great to begin with, and after the sculpting, it was a real mess. It looks good, but it's a mess. And all this messed up geometry means Hexagon doesn't want to split it how I want it to. I can't bring this into Aspire the way it is, as all the undercuts would be filled, and not to mention it's thicker than any one material I have. Long story short, I need to slice it. After thinking about it, I decided on a new approach. I would strategically place cubes around it, then remove the cubes in Aspire, leaving the portions of the brain I need. 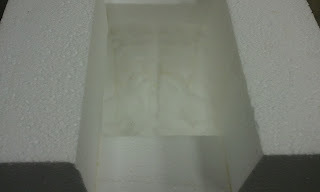 Here I added a center cube rectangle in the dead centre. This gives me the left and right brain halves. 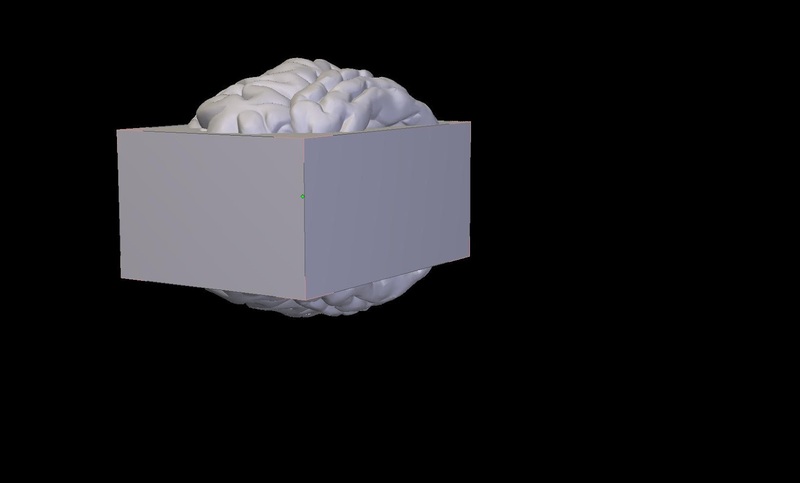 When I import this into Aspire, I'll sink the model into the zero plane so the brain part is the only thing sticking up. The brain is symmetrical, so I only needed to mirror the other side, instead of importing it twice. I continued to work my way around the brain with the cube method. Now it was important that the cube faces be touching, not overlapping. This would keep the brain pieces working together properly. Here's how one piece looks when I'm importing it in to Aspire. 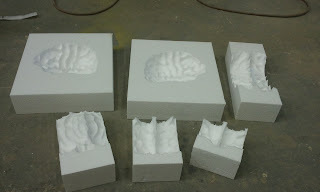 All the cubes come in, with the brain and I'll just trim them off after they've been pasted down. After trimming the cubes off, I'm left with the portion I need. Now for the fun part! I don't want to machine this as the final piece. I want to make a mold. I said before that I wanted it to glow, and we have clear casting resin in stock that hardens up in around an hour. I could have machined the brain as a 'positive' shape, and made a rubber mold. 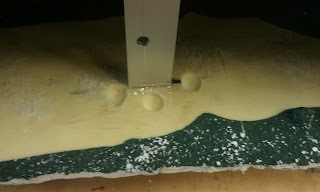 But this would have required waiting overnight for the mold, then we would have had to make a "jacket" to support the rubber mold, then the couple of hours for the resin to harden up. We just don't have the time on this, it shoots on Thursday. So instead, I machined the brain as a negative component, and I used styrofoam as the mold material for machining. 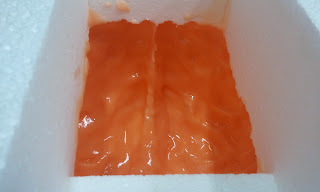 The casting resin will bond really well to the styrofoam, but that's not really a concern, as we are going to bust it off in the morning, and clean-off any styrofoam bits with lacquer thinner. 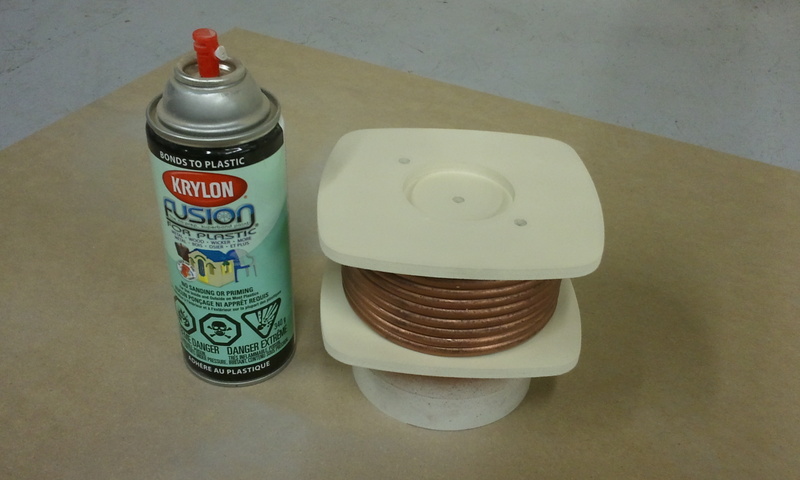 This wont hurt the resin at all, as it's a urethane and very durable. 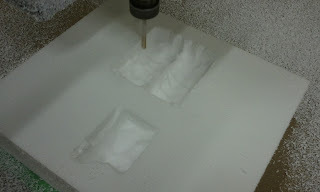 I made sure that the styrofoam blanks were lined up exactly along the Techno cnc's axis. Making sure the blanks were aligned to the edge of the material made the task of trimming the mold parts on the table saw very easy! After all the parts were trimmed on the saw, I heavily coated the gluing surfaces with Super 77 spray contact cement. 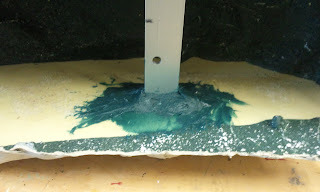 I used alot of it in hopes to create a seal so the resin wouldn't poor out the seam joins. 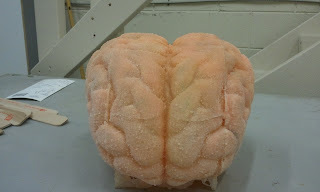 It's a little hard to see in this pic, but this is the result of all the blocks glued up, leaving the open 'brain cavity' mold. 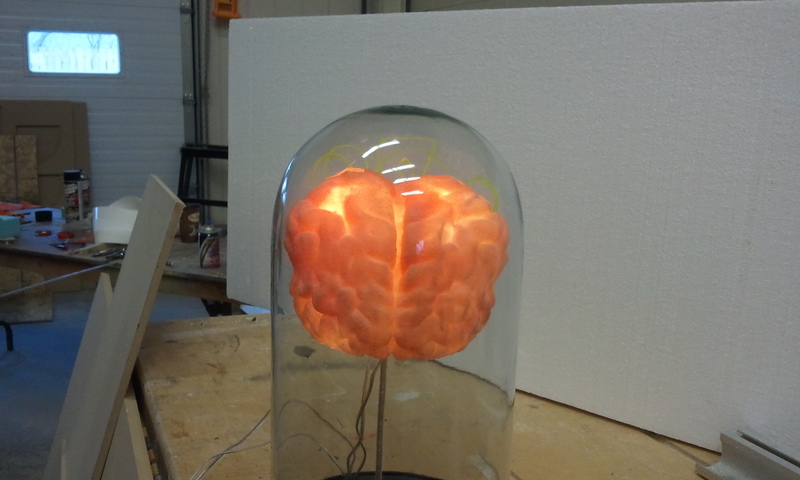 We mixed up the clear resin with some tint in it to give the brain a fleshy, translucent colour, rolling it around to coat all of the inside. After it became solid enough, I drew veins all over it, in hopes that they would show through faintly when the light is added. We added one more layer of coloured resin, then backed it up with a few more layers of just clear. I don't want to opaque it out totally. The resin does get quite hot, especially in an insulated mold like this one. I'm hoping that the first thin layer was enough to protect the styrofoam from melting under the heat. It should be o.k. but I won't know until I crack it out in the morning.